CD review: "Fly by Night"
This review first appeared in the March 14, 1997 issue of the North County Times. 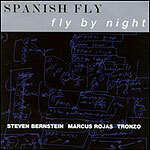 If you dig the way-out, the real avant-garde, then check out this album by Spanish Fly. To start with, the instrumentation is not the norm: trumpet, tuba and slide guitar. And the compositions are ethereal wanderings somewhere between classical and jazz. The six-movement title composition was commissioned by the San Francisco Ballet Association, and if there's a video of the dance choreographed for this, that would be something to see. One movement, "Some Other Sisters," has funky interpretations of children's classics "Bring Back My Bonnie to Me" and "I've Been Working on the Railroad." But the whole thing is experimental while still being very accessible, if a bit startling at times.